Yes, desserts can be included in the diabetic diet, and there are a variety of diabetic cookbooks with dessert recipes to choose from. Remember to count them towards your exchanges for the day. If you are following the diabetic exchange system, your goal every day should be to get the nutrition your body needs within your allowed number of exchanges of each food group. Having a dessert is not always the most nutritious way to "spend" your exchanges, but they do not have to be totally excluded from your diet. Having a little bit now and then may keep you from wanting to overindulge later on. Combine water and oil in a small saucepan and bring to a boil. Combine flour, sugar, and cocoa in a mixing bowl. Add hot water and oil to mixture and stir well. In a separate bowl, combine buttermilk and baking soda; stir until soda dissolves. Add buttermilk mixture and egg to batter; mix well. Coat a 15x10x1-inch jelly roll pan with nonstick cooking spray. Spoon batter into jelly roll pan and bake for 15 minutes. 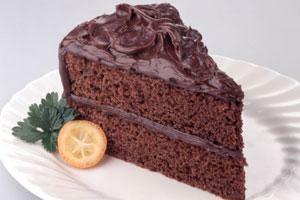 To make frosting: Combine margarine, buttermilk, and cocoa in a medium saucepan; bring to a boil. Add confectioner's sugar and vanilla. Blend until smooth. Frost brownies while warm. Cool and cut into squares. Makes 3 ½ dozen brownies. Per 2-inch square serving with frosting (about 1 oz): 135 calories, 2g protein, 26g carbohydrate, 1g fiber, 0 mg cholesterol, 59 mg sodium, 4g fat. Adapted from: "Meals on the Move: Rush Hour Recipes"
Cream margarine, sugar, peanut butter, and sugar substitute (if using) together at medium speed until light and fluffy. Add egg whites, vanilla, and water and mix at medium speed for 30 seconds, continuing to scrape the sides of the bowl. In a separate bowl, stir flour, baking soda, salt, and chocolate chips together to blend well; stir gently so as not to break chips. Add to creamed mixture and mix to blend. Spray cookie sheets with vegetable cooking spray. Drop 1 1/2 tablespoonfuls of dough onto cookie sheets. Bake 10 to 12 minutes, or until cookies are lightly browned. Leave on sheets 3 to 4 minutes, then remove cookies to wire rack and cool to room temperature. Heat margarine, chocolate, milk, apricot preserves, and espresso crystals in small saucepan. Whisk frequently until chocolate is almost melted. Remove pan from heat; continue whisking until chocolate is melted and mixture is smooth. Add egg yolk, vanilla, and sugar substitute, whisking until smooth. In a separate large bowl, beat egg whites and cream of tartar to stiff peaks. Fold chocolate mixture into egg whites, then fold in combined flour and salt. Lightly grease bottom of 9-inch round cake pan and line with parchment paper. Pour cake batter into pan. Bake in oven 18 to 20 minutes until cake is just firm when lightly touched and toothpick comes out clean (do not over bake). Carefully loosen side of cake from pan with small sharp knife. Cool cake completely in pan on wire rack. Refrigerate until chilled, 1 to 2 hours. Remove cake from pan and place on serving plate. Spread with chocolate glaze, if desired. For chocolate glaze: Heat milk and chocolate in small saucepan, whisking frequently, until almost melted. Remove from heat and whisk until chocolate is melted and smooth. Whisk in sugar substitute. Cool to room temperature. Refrigerate glaze, if necessary, until thickened enough to spread. The recipes are low in carbohydrates for the most part, as long as the portion size is adhered to. Because many desserts are concentrated sources of sugar and fat, portion size should be moderate. If you are eating a food packaged with a nutrition label, check to see how many carbohydrates are in one serving. One starch exchange is 15g of carbohydrate. The free glycemic index chart is another helpful tool to help monitor sugar in foods, not only your desserts.